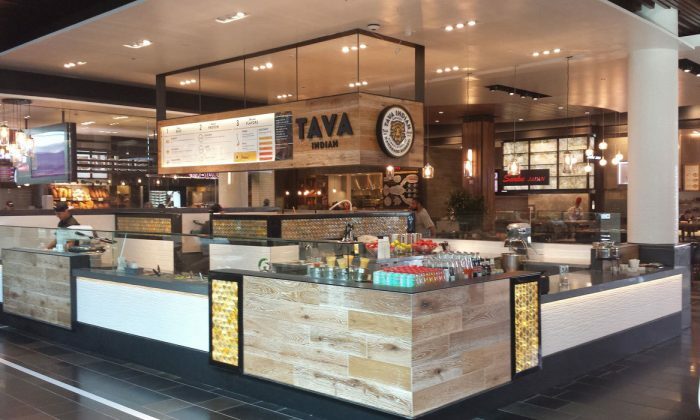 When Tava Indian Kitchen in Palo Alto, Calif. holds its grand re-opening, guests will see a lot less of the Indian character that got the fast-casual chain its start. Tava’s management team has concluded that America is not ready for an authentic Indian fast-casual experience. As part of a complete menu and brand overhaul, a version of the chain’s famous Burroti will still be there, but it will now be referred to as a wrap. Tava founders Vijay Brihadesam, Hasnain Zaidi, and Jason Pate—friends who met at Duke University and left careers in finance to start Tava—conceived of the Burroti as a “burrito-style wrap,” with the wrap provided by Indian roti flatbread, and the filling of rice, spicy entree, and fresh vegetables. The chain’s signature Burroti is in part why Tava has earned its reputation as the Indian Chipotle. Tava allows guests to choose from the Burroti, rice bowl, or salad bowl, and then customize as they go down a line. With the rebrand, under CEO Jeremy Morgan’s leadership, Tava is moving toward menu items that have broader appeal with Americans. For example, the new restaurant name and logo will exclude the word “Indian.” Based on the company’s new Twitter account, it appears the new name for the restaurant will be Tava Kitchen. There is still a barrier around Indian cuisine. Morgan is the former SVP for Smashburger, one of the country’s top fast-casual restaurant chains, which built out hundreds of new locations under his tenure. He became Tava’s CEO in July 2014, after a stint supporting the company as a board advisor. The new menu favors hearty, meaty entrees like Braised Beef, Lamb Meatballs, and Pineapple Glazed Salmon, served with rice, and a choice of sides. Sides include Glazed Sweet Potatoes with Himalayan pink salt, Mac & Cheese with south asian crumb, and Crunchy Kale & Quinoa with masala vinaigrette. At first glance, the new menu comes across as having little to do with Indian food, and that is on purpose. Aside from a Signature Chicken Tikka option, the Indian ingredients that are listed on the menu are de-emphasized. For example, the “Indian spice dusting” that comes on the Baked Marble Potatoes is written in a finer font. Morgan acknowledges that despite an increasing mainstream acceptance of ethnic food in America, there is still a barrier around Indian cuisine. If the name of the item is a barrier, that is silly. Change the name. “We believe that Indian is at a spot not dissimilar to Mexican and Chinese in the 1970s,” he said. Based on Tava’s market research, people either love Indian food, or think they don’t like it without trying it, or vehemently dislike it, usually because they find it too spicy. Morgan said what someone imagines a food to be, based on an unknown name like beef vindaloo, can be an obstacle for some people to try the food. So Tava renamed the vindaloo as braised beef. Morgan’s philosophy: “If the name of the item is a barrier, that is silly. Change the name,” he said. Actually, the strategy is a lesson successful national chains before Tava have already learned, said Morgan. Panda Express serves orange chicken and Kung Pao chicken, but these are not dishes you get in China. They were made up as a way to communicate to Americans more clearly what the food is. Think of Tex-Mex, said Morgan. That is not the way people eat in Mexico either. Over the past few years, experts have periodically predicted that Indian cuisine will be the next big thing, but so far that has not been the reality. Some of the reasons have to do with Americans’ lack of familiarity with the cuisine, the small number of Indian people living in America (2.8 million, according to the 2010 Census), as well as the large number of mediocre restaurants out there serving overly-spiced, overly-heavy foods. Tava’s millennial generation founders are among a recent boom in young people, usually second generation Indians, conceiving of Indian fast-casual restaurants. There is the trend in conception of Indian fast-casual. Fast-casual is a restaurant format that typically sells unprocessed, fresh food, served at a counter, in clean, modern environments, with price points ranging from $8 to $12. Krishnendu Ray, an NYU food professor and an expert on Indian and ethnic cuisine in America, said he has gotten more calls about this subject than anything else in the last two years. They want to change the public’s negative perceptions by serving the wonderful Indian food they grew up eating, he explained. While the Burroti is very clever, Morgan continued, some people thought it was a misspelled word, and some people didn’t understand what it was. His preference is to be straightforward with what menu items are, and Tava’s founders were very amenable to changing things, he said. We are expanding the definition of what Indian food is. Morgan wants to position Tava like any other mainstream lunch or dinner choice among American staples like Panera, Noodles & Company, Chipotle, or Smashburger. The plan is to expand Tava nationwide, and that means reaching people outside the major food savvy centers like Silicon Valley or New York. “If calling Tava an Indian restaurant is setting the wrong expectation, then this is just a word. I am not trying to hide it, but I am not willing to slam the door on anyone,” said Morgan. Eating is social, and if families chose not to eat at Tava because one person didn’t like Indian food, that wouldn’t work, said Morgan. This is why the new Tava will offer enough variety that it makes it easy for everyone to find something they like, and none of the food will be overly spicy either. “We are expanding the definition of what Indian food is,” said Morgan. Founded in 2011, Tava operates three Bay Area locations, in San Francisco, Palo Alto, and Santa Clara. The relaunch will affect only the Palo Alto location for now. Last June, the company won $4.5 million in series A1 investment, led by the CircleUp Growth Fund, Kensington Capital, Agilic Capital, and former Smashburger CEO David Prokupek, through his investment fund HiGrowth Advisors. As part of the transaction, Prokupek, who was named Fast Casual’s #1 Mover and Shaker in 2012, joined Tava’s Board of Directors. The team is looking forward to getting more feedback on the new menu and concept, and they are prepared to make adjustments in order to get everything just right before moving to expand the number of locations. Currently, the plan is to open a fourth location in Alameda, Calif., in May, and to enter the Denver, Colo., market with two locations by year-end. CLARIFICATION: A previous version of this article stated Tava Indian Kitchen would hold its grand re-opening event on Feb. 17, but due to permitted delays it is being rescheduled.